As we get into the heat of the summer it can be difficult to keep even the healthiest lawns green without daily watering. If you aren’t struggling to keep your lawn green, you may be one of the many homeowners who stopped watering during the drought, and now have a brown weedy mess left as your home’s first impression. Planting directly in that landscape would result in a frustrating battle with leftover grass & weeds, and digging it out would be time-consuming and difficult. There is a simple solution to remove your lawn that will not only kill off any of the old grass & weeds, but will create a fertile and healthy planting space as well. Mow your lawn as short as possible and pull up any large vegetation. It is best for the bottom layers to be moist, so water the space so it is slightly damp or start the process after a light rain or heavy fog. If you are planning on adding any large plants like trees or bushes, plant them now. This is a crucial step that many people overlook. Your yard most likely has some serious soil deficiencies from lack of watering & plant diversity. It is important to create a healthy planting space for whatever you decide to add once your lawn is gone. Healthy composted soil not only provides the nutrients that your plants need, but will help retain water so you won’t need to water as much. We recommend covering your space with 1-2 inches of the Soil Builders Organic Compost. This can be done with boxes you find behind a grocery store or rolls of recycled cardboard to make the job easier, just make sure to look for boxes without any wax or labels. Overlap your cardboard by 6” so no weeds pop up in between. Just lay the cardboard out in rows or tack it down with stakes so it doesn’t move. This would be a good time to cap your old sprinkler heads & add drip irrigation lines for any plants you plan on adding. At this point your neighbors might panic thinking you are going to have a yard full of cardboard, but rest assured, as soon as you are done they are going to want to do the same! This will not only make your yard look more finished, but will help hold in moisture for your upcoming plants and kill out any stubborn weeds that might pop through. 3 to 6 inches of Arbor Mulch is a good inexpensive organic choice, and there are Colored Barks if you want something to match your home’s aesthetic better. At this point you have 2 choices. You can leave your yard of mulch as is and let the grass die out (should take a few months), or you can begin planting right away. If you do plant right away you might see some grass or weeds come through to your planting spots, but if that happens just pull them right away and cover with mulch making sure to leave a little breathing room around the base of the plant. Lay out your new plants in the areas you want to add vegetation. Once you have your layout figured out, pull back some mulch and cut an X through the cardboard just big enough to add your plant. Dig a hole, add your plant, cover with the soil & compost, pull the cardboard back around as much as possible and cover with mulch. Be sure to keep your new plants hydrated well for the first few weeks while they are establishing their roots, then taper off. You will notice you need to water less and less as time goes on because of the water retaining abilities of the compost & mulch. And that’s it! Now you have a beautiful new yard, no more weeds or dead lawn & less thirsty landscaping. 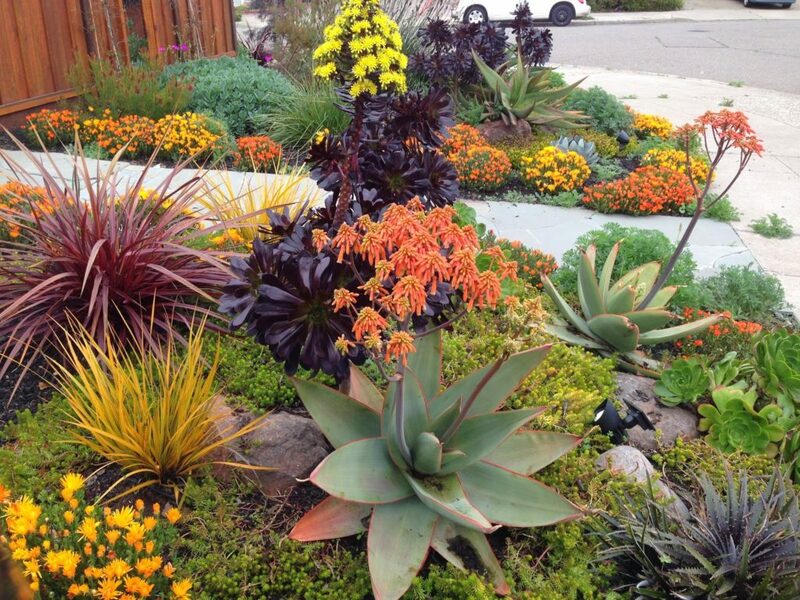 There are many ideas online for drought tolerant landscaping and UC Master Gardeners of Sonoma County is a great resource for finding native plants that work great in our climate.